Wow, what a long holiday this weekend and Happy Independence Day to all Malaysian. Today I found a new online store specialise for Korean's product - Althea Korea. Some of you maybe busy for work, household and always run out of time. As a blogger, we always wanted to share about beauty and make up experience that save a lot times and money to all of my reader. Althea Korea is cost saving, easy access, deliver on time and trustable website. All of your headache are gone... Yeah!!! I understand some of you ought to hesitate is this website fake or not but don't worry, Althea Korea is absolutely trustable as they guarantee that there will be no fake products will be sold on their website. They even promise if any fake product you got from them, they will refund 200% on your purchase value. Plus, the products will be ship straight from Korea to your door step; and they will be no agent for service charge and so on! Some compliment on Korean's product. 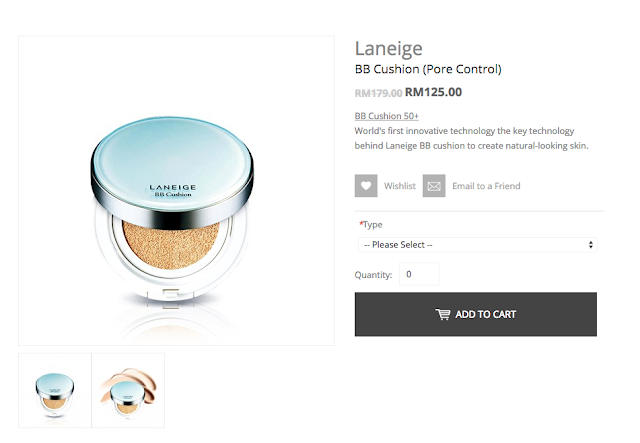 I am so in love with Laneige's BB Cushion. Although is my sister who bought me as my birthday gift and I really thankful she recommend me this Korea product. You can also purchase Laneige's product from Althea Korea's website too. OMG~ look at the price for Laneige's BB Cushion. If you purchase from Althea Korea, you can save up to 30%. Unbelievable right. Beside Laneige products, they even have a lot hot selling stuff from Korea. Althea Korea is directly connected to brand's owner and reputable supplier, hence why they got the unbeatable price and services. I believe Althea will become one of the top online store for Korean's product in near future. The price that shown are Ringgit Malaysia on the website, so they will be no confusion and issue about currency conversion. Beside that Althea Korea also offer free shipping for order that above RM150. What if you shop less than that? The shipping cost will depend on the product weight. What about the payment method? Althea Korea uses the services from PayPal and MOL (Visa, Master Card, Maybank2u, MEPS, FPX, etc) which is very convenient for shopper. Here are the link to their page.. what are you waiting for?